There is a custom in India of honorning the lineage of Gurus. This custom is prevalent in all different traditions. They all make a special mention of a triad of Gurus which consists of the presenty embodied Guru, and the immediate two preceptors. A similar triad is mentioned in the middle of the lineage and another triad at the hoary beginnings of the lineage. For example, Shankaracharya, his Guru Govindapada and his Guru Gowdapada form the mid point triad in some lineages. Narayana, Brahma and Vasishta form the trite triad in these same lineages. The famous Guru Gita text mentions the triad of Gurus with the phrase "Srinaathadi Gurur trayam". Sri Sri Ravishankar referred to this phrase during the recent Gurupurnima celebrations in San Mateo, California. He explained the nature of the three bodies of a Guru. A Guru has a physical body, a subtle body and a causal body. Human beings have a subtle body which consists of the internal faculties such as mind and intellect. The subtle body of the Guru is more expansive and is pure. The Guru principle is the internal guide which upholds the wisdom in all human beings. A Guru recognizes the yearnings of his followers through the medium of the subtle body. A spiritual practitioner purifies and expands his or her subtle body through Yoga, meditation, mantras and other practices. 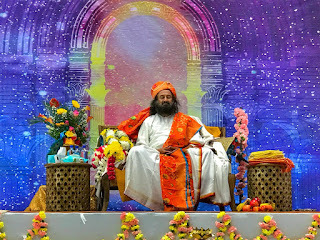 A few thousand people attended the Gurupurnima celebrations with Sri Sri Ravishankar in San Mateo last week. The hall was filled with music and silence. The space in the hall became the subtle body of the Guru. Everyone left that sapce with more enthusiasm, determination and joy.